A vampire costume is always a Halloween favorite. When dressing up as a vampire, there are plenty of elements to wear that can make your costume stand out from the crowd. There are many different styles of costumes and capes you can choose from. Actually, you could even go without a cape. Those vampires from Twilight don’t wear capes and they seem to be alright. You can also dress up your vampire costume with some cool fangs, spooky contacts, or even an accessory like a medal. How does one get a vampire pendant like this? 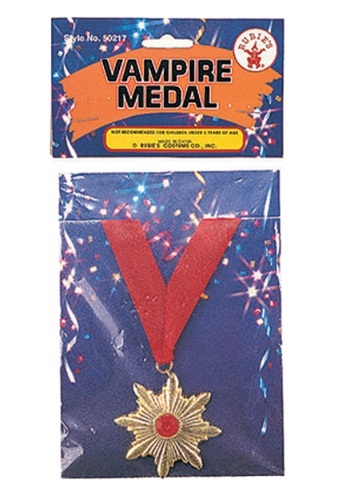 Do you have to win one at the vampire Olympics? Of course not! You can get this stylish medal from HalloweenCostumes.com and save yourself the grueling hours of training. This faux gold pendant features a red rhinestone in the middle and hangs from a red ribbon necklace. If you’re looking for a unique accessory to add to your vampire costume this Halloween, do yourself a favor and get this vampire pendant!